$14.95 (US) Including Shipping for US Customers. If you didn't know, Juice Jacking is when you innocently plug in your mobile device to a public charger, and instead of just getting a charge, your device's data is stolen. Sound far fetched? Have you ever tried to charge through a USB port in an airport? Do you really know where you are getting your power? When you need to charge away from your desk, do you know what’s behind the USB port? You really think that is safe? Could there be a computer behind the charging port trying to steal your personal data? Did you ever plug your cell phone into a rental car to charge? It certainly is convenient. The car itself will often try to be helpful and download information from your phone. But you don't know who had the car last. Is it just the car's USB port or was something more sinister installed by the last person? The Plug ‘n Safe cable sits between your Smart phone or Pad's charging cable and your power source. 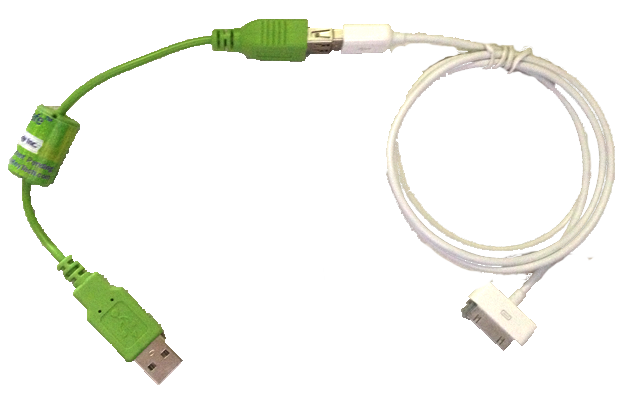 This special (patented) cable prevents anything from syncing with your device through the cable. Nothing can be written to the attached device, it can ONLY recharge. Plug ‘n Safe is easy use and very reliable. Juice Jacking cannot occur through a Plug ‘n Safe cable. Only power is allowed through to your phone while still allowing the phone to recognize the cable and charger. With Plug ‘n Safe you can use your laptop or desktop to charge your phone. With Plug ‘n Safe you cannot sync the phone. In fact the computer will never see the device except for providing power to it. The hackers' method of Juice Jacking a phone to steal its data will become a thing of the past. This also means you can use your Business laptop or desktop to charge your phone and your corporate network will be safe from any possible bad stuff on your phone. And vice versa. For Apple users, Plug ‘n Safe allows for device charging while playing. No Syncing allowed! Not only does Plug 'n Safe protect your device from prying eyes, it prevents the App Store from launching and interrupting your device. None of the awkwardness trying to explain to the App Store that you are just visiting. Of course, this feature works for Zunes, too! I'm sure that both of the remaining Zune users will really appreciate this feature. Think we are being too paranoid? We get that a lot. Not so much after certain government revelations, though. Device Port: USB 1, 2 or 3, USB Female Type A connector. Compatible Devices: Any Smart Phone. Heck, any dumb one too. Oh yeah. And tablets. For your protection, each cable is individually tested. US Patent D738,312. Ready to Buy and in the US? Just click the big orange button below. International Customers please contact us for the current shipping cost to your country.